We’d love your help. Let us know what’s wrong with this preview of Women Who Don't Wait in Line by Reshma Saujani. 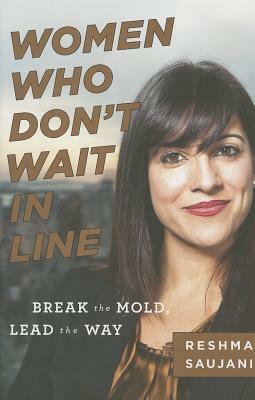 Women Who Don’t Wait in Line is an urgent wake-up call from politico and activist Reshma Saujani. The f There’s never been a better time to be woman. We live in an era when girls are told they can do anything. So why aren’t we seeing more women rising to the top ranks of corporations and the government? Why don’t our girls have more women in leadership roles to look up to? To ask other readers questions about Women Who Don't Wait in Line, please sign up. This is a brilliantly written book by an activist who calls for women to enlist in redefining themselves, and in remaking America. Gloria Steinem and Betty Friedan brought women to the point of equality and it is up to the women of 21 century to walk past the door to make a difference in their own lives and for others. The author believes that women are not walking fast enough to make changes. They have to change inequities they face and must change themselves. They must really look themselves and explore what holds them back individually. Work through your aversion to risk and failure, embrace ambition, and put aside judgment of one another in a sorority of sisterhood, says the author. This book was written as a challenge to the next generation of women to think about leadership differently. Celebrate competition, pursue failure, build and prosper sisterhood, and learn to be like yourself and not following or emulating others, pursue dreams and opportunities with all your energy. This book is the story of her experience and the experience of women of her generation. Inspiring women to think how they view leadership, how they teach children and how they can go around to making their dreams a reality. She says, women are inner activists and calls for awakening this spirit and inspire other women to do the same and remake the nation. Congressional candidate Reshma Sujani is a young Indian American woman who audaciously ran against the eighteen year old incumbent, Representative Carolyn Maloney for New York's 12th congressional district. She lost the election but gained the insight back into what is holding women back. She thanked Congresswoman Maloney for the opportunity to find passion and dedication to Sujani's beliefs and try to make her dream a reality. Her loss made her even stronger and bolder about pursuing her dreams. Someday, I would love to read a book about being a woman in business that didn’t require I also read about being a mother. If you have a girl old enough to handle adult reading, this is a great gift. It weighs the opportunities and challenges facing women, though in between also offer a lot of sage advice for just about anyone. Saujani can reflect on her place as a woman, as the child of immigrants and as a political activist, giving some unique views around what is required to bring women to the same social level as men. Sadly this might deter readers hung up on political partisanship and difference about social va If you have a girl old enough to handle adult reading, this is a great gift. It weighs the opportunities and challenges facing women, though in between also offer a lot of sage advice for just about anyone. The book did a good job of firing me up to push myself beyond the limits society and other women impose. Is "paying your dues" a good thing? Or is that the kind of new perspective we need? I first heard of Reshma in the latest NY elections, and my husband and I voted for her in the primaries because she sounded great. I was really excited to see this book in the Goodreads giveaways, and I was very thankful to win a copy! It wasn't earth-shattering, but I'm glad I read it. It was a really short re The book did a good job of firing me up to push myself beyond the limits society and other women impose. Is "paying your dues" a good thing? Or is that the kind of new perspective we need? I first heard of Reshma in the latest NY elections, and my husband and I voted for her in the primaries because she sounded great. I was really excited to see this book in the Goodreads giveaways, and I was very thankful to win a copy! Good but a bit repetitive. I enjoyed the book as the writing style was good and engaging, and the content was interesting even if i did know a lot about the topic prior. My only gripe was that it was pretty repetitive. I would recommend this book regardless! I've read several books like this, which means I've heard her arguments before. This is a quick, easy read, which makes it accessible but shallow. I've watched the author's TED talk about how we should teach our girls about bravery, not perfection. I've learned about the non-profit organization to help teach girls how to code. This is near and dear to my heart. I started as a high school student just playing around with code. I never thought it would be my career. I found this book fairly inspirational. Sometimes, I do feel like I always need to be polite and proper because I'm a woman. But I've learned that I can't wait for someone to hand I've watched the author's TED talk about how we should teach our girls about bravery, not perfection. I've learned about the non-profit organization to help teach girls how to code. This is near and dear to my heart. I started as a high school student just playing around with code. I never thought it would be my career. Reshma's inspiring story was woven into a quick and easy read with examples of ways we can all make changes and do things that will help us achieve our dreams and aspirations. It also addresses how women can help other women or influence others to support women in achieving their dreams. It's very action oriented. A good read for sure. Lots of practical advice for women getting ahead in their lives. What they and their partners and friends can do to get more women into leadership positions in a variety of fields, but especially STEM related fields. I identified with Reshma's life experiences, especially as a young South Asian woman. However, I wish her writing approach was more personal/insightful rather than statistics/research paper oriented. I admire all of her accomplishments and look forward to tracking her future successes. The author creates as easy read about her own leadership journey. Many of us will find we have faced similar challenges. Her positive tone makes the book enjoyable. Very well written, lots of quotations from inspiring women and lots of good advice. A great read for all women, but one especially important for young women. If you have a teen in your life or a woman just beginning her career, place this book in her hands. I am not the target audience for this book, and there was some redundancy that could have made for a better read with tighter editing. Many of the lessons of risk, resilience, and mentorship that she describes I have already experienced and incorporated into my own life. That said, this a great book for up and coming young women, and serves as a good reminder for those of us who may be caught in a rut. At the very least, it is a call to action for sisterhood and activism. To repurpose a popular I am not the target audience for this book, and there was some redundancy that could have made for a better read with tighter editing. Many of the lessons of risk, resilience, and mentorship that she describes I have already experienced and incorporated into my own life. That said, this a great book for up and coming young women, and serves as a good reminder for those of us who may be caught in a rut. At the very least, it is a call to action for sisterhood and activism. To repurpose a popular song: Sisters need to do it for themselves, and that is the ultimate message of this book. Reshma is an inspiration to all young women with enormous professional aspirations. She illustrates through her story that with persistence and tenacity, you can also accomplish your goals. I am reading this book at a very low point of my life and I am very grateful for her encouragement, even though it's through a book. Her personal story deeply resonates with me and all the stories about successful women in this book greatly empowers me to dream big and boldly go out into the world and fight f Reshma is an inspiration to all young women with enormous professional aspirations. She illustrates through her story that with persistence and tenacity, you can also accomplish your goals. I am reading this book at a very low point of my life and I am very grateful for her encouragement, even though it's through a book. Her personal story deeply resonates with me and all the stories about successful women in this book greatly empowers me to dream big and boldly go out into the world and fight for my dreams. She also encourages women to support other women, which I think is very important. If you have read and loved Sheryl Sandberg's Lean In, you'll definitely enjoy this book. In 2010, Reshma Saujani challenged Democratic Congresswoman Carolyn Maloney in a primary. Even though she lost, she calls it the most successful campaign ever lost. She took a risk, didn’t wait in line until it was her turn, and is now encouraging other women to do the same in Women Who Don’t Wait in Line. I like her boldness, her confidence, and her willingness to take risks and fail. It's a quick read and it's given me some good ideas. First on the to-do list: learn to code. Who runs the world? Girls. No, seriously, this is a great book for women leaders to read. A book about empowerment, courage, and persistence. How to strike a balance between "acting like a lady" and being a "strong and confident businessperson." Woman are often held to different standards than men and are still lagging behind regarding equal pay, job promotions, and other business success barometers. Keep striving. Reshma Saujani certainly feels passionate about women succeeding in the professional world. She offers plenty of personal stories as well as citations get her points across. This book would be good for any woman wanting to further her career. I received this book for free through Goodreads First Reads. I really enjoyed the first part of the book and respect her courage and message. I agree that women need to push and strive for leadership roles. I did not like and strongly disagreed with the end where she spouted off tired feminist notions and regulatory government solutions. Overall, a thought provoking read. I saw Reshma Saujani on ABC's This Week as part of a round table of women leaders. She impressed me and I wanted to know more about her story. She has an inspiring message. I think the book is most appropriate for young women in college but everyone can gain some insight from it. In essence, I agree with what she was saying. This book is perhaps a distant relation to "Lean In". However, it wasn't very well organized, and the writing style didn't agree with my sensibilities. So I put it down. Reshma Saujani is of a new generation of women, struggling with age-old gender issues but with confidence and energy that is modern. A very easy and quick read, Reshma had me inspired. I have flagged passages to share with female co-workers!